We're into the second day of the new Klout algorithm politely referred to by some as #Kloutapocalypse: and despite everyone's complaints the reality is Klout is not going to rollback anything. Of course the complaints are only from people who saw their scores go down. I haven't seen too many tweets or Facebook status updates screaming "WOW my Klout Score went up 10 points". From asking people I did hear from a few who stayed the same or went up slightly. As part of what is called the "Klout Squad" was given the heads up on the new algorithm and interface a few weeks back and was on a group call yesterday morning just before the roll-out of the update started. This gave me a heads up of what to expect and to some extent come to the defence of Klout. Another part of the call was a high level (Klout's not going to share their algorithm in detail) of some of the changes in the algorithm and why scores are going to change. So now that the dust has settled and I've had some time to investigate my own profile here are some thoughts and recommendations to dealing with the change. Klout scores are just that a score based on your activity. 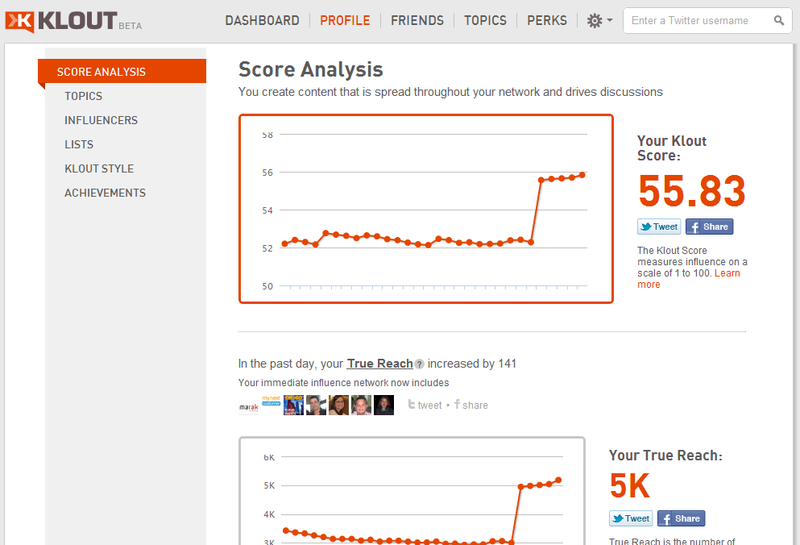 There was no sudden drop since Klout ran a 30 day backdate of their data. So take a look your score might even be on the rise over the past 30 days, it's just that the base line has changed; The percentage change in my personal score over the past 30 days actually is marginally higher under the new algorithm. I was fortunate enough to have a screen shot of it from 2 days earlier as I was going to use it in a presentation next week. Klout now values facebook activity equally to Twitter and other social properties. If you've only been concentrating on Twitter for the past 6 months and ignored Facebook then yes your score is likely to go down compared to someone who's been doing both. Since "Social Marketing" is not just one platform, Klout is correct in making this change. The influence calculation has always been an exponent and some of the weightings have now changed. 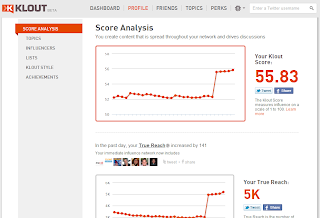 Klout is now putting a much higher value on interactions with your primary influencers. They even now show you who they are and what their scores are. This means you need to have serious interactions with people who are deemed influences to raise your score. You must be seen as influencing them. This is where I found some interesting and odd results in the new Klout. Some of the people listed (I do know who they are), I've never exchanged a tweet, saw them RT anything of mine. I have seen the odd "Like" of a facebook status update. This begs the question, what about all people who retweet my tweets? Do they not count? Personally I think I'm wielding more influence on them then some of my facebook friends. For a few upcoming conference address I was planning and still am talking about measuring social media. Perhaps this will bring more people out to my sessions. The point of my addresses is not to put value in the score itself, but look at what it is telling you about how your expanding your audience and how effective you are at influencing them. This is something that hasn't changed even with the new algorithm. To demonstrate the real issues and what I must do restore my Klout score if I should chose to, I turned Twitalyzer (a measurement tool that only measures Twitter influence & impact) and their comparison report between Klout and PeerIndex. You can see the dramatic drops in the various components scores that make up the overall Klout score plus the increase in "True Reach". What I tend to focus on is the percentile report (as calculated by Twitalyzer) which compares my score to other Twitalyzer users. For all but the Klout Network values were only minor adjustments in this percentile despite dramatic changes in the score. This tells me that I was equally impacted. When it comes to the Network score I have concerns. These concerns as I expressed yesterday may be an issue with how the back-dating of the algorithm change occurred (which showed a dramatic drop on Oct 2 for no apparent reason) or as Klout explains on their site, I need to start interacting with more influential people to raise this score. It's this last point that truly concerns me. If Klout is putting an exponential weight on the Klout scores of people your interact with, will people stop interacting with everyone and focus purely on communications with those who have a higher Klout score? I for one won't do this, but I'm sure there will be some will that try. So for now, move on - nothing to see here but a new scoring model. And it's your own dam fault for agreeing to a MBO bonus based on a measurement tool that is owned by a 3rd party and subject to change at their whim. This is the same as SEO's complaining that Google changed their algorithm and their bonuses of how many pages were on the 1st page disappeared. Their bonuses should be measured on how effective their efforts were at driving quality traffic to the clients site. Just a a Klout score is an indicator of how effective you are at interacting with your audience, true success must be measured in how effective you were at using this form of communication to bring quality people to the corporate website, retail outlets, impact overall sales, improve customer satisfaction, increase customer retention, etc. Have you checked your Klout Score this afternoon (October 26, 2011)? Klout is rolling out a new interface and new algorithm this afternoon. I haven't heard yet from anyone who saw a significant increase, but lots of people complaining about big drops. Of course those who don't care about their score are complaining the loudest. While I personally don't care about the actual number (beyond it's fun to watch it go up and down), the fact the my Klout score dropped from 68.11 this morning to 55.83 this afternoon is shocking. Was Klout's algorithm that bad that the adjustment is so significant or will be a matter of time for their servers to properly process all the historical data or alternatively just start processing the new stuff. My theory is that since I'm a high volume user of Twitter, that Klout might have had issues pulling a historical record of my past tweets and that's why there is such a significant increase over the past few days (in the reprocessed data). I don't know, but will keep my eyes on this. My biggest concern however is that organizations that use Klout scores for various things (including selecting event speakers, etc.) might not be aware of the change and still be looking to reward people with scores of over 60.